"Due to the strong focus on individual cell types, our analysis represents an important milestone for our research on cambium regulation. We more and more understand the exciting complexity of the regulatory network important for a very dynamic growth process which produce a large part of the biomass present on this planet," said Thomas Greb professor of the Heidelberg University Centre for Organismal Studies and principal investigator of this study. The xylem transports water together with dissolved nutrients and the phloem transports sugars essential for growth and development of cells. &laquoAdult» vascular tissues are formed by dead cells and grow constantly in volume due to divisions of stem cells sitting in the cambium. It is important that xylem and phloem are not only produced during the embryonic period but throughout the plant life cycle. When the cambium &laquodies», so does the stem. Scientists managed to study wood formation mechanisms in model plant Arabidopsis thaliana, the weed that doesn't form thick wood itself. Intriguing, but Arabidopsis has all the genetic mechanisms required for wood formation. 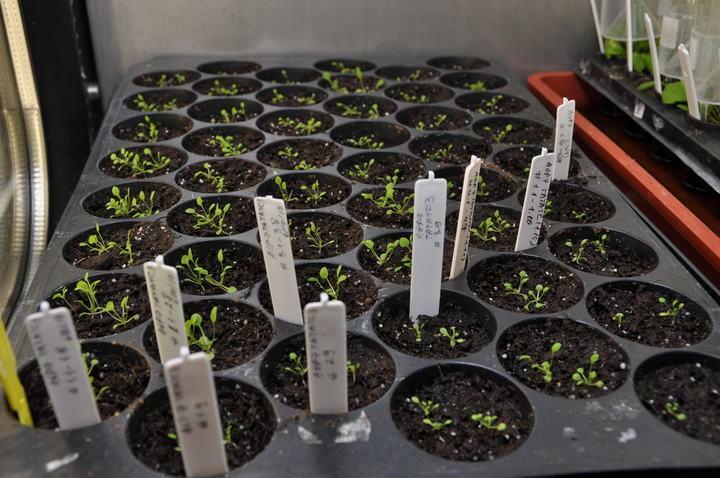 Thus, all the advantages of the model plant — a small size, a short life cycle and well-annotated genome – are used to investigate the complicated mechanism. It was shown on Arabidopsis that a small molecule auxin is a King among plant hormones. It's responsible for a huge amount of different jobs — following the sunlight by plants, responding to gravity, as well as controlling development of all plant organs, including embryos, roots, leaves and stems. Cambium activity has been tightly associated with the plant hormone auxin for a long time, but at the level of gene regulation (the &laquoreading» of the genetic information), the process was studied with such a high accuracy for the first time. To do that the collaborators from Germany, Austria and Spain created transgenic plants with visualized regulatory proteins, responsible for cambium formation and further differentiation (WOX4, ARFs and others). With these plants, it was possible to observe the spatial distribution of auxin signaling components and auxin responses in the cambium area. Firstly, using transgenic plants the authors detected auxin response signal in the xylem-associated cambium. Secondly, study of transgenic lines visualizing regulatory proteins in the cambium discovered that WOX4 meets the auxin response factor ARF5 exactly in the xylem-associated cambium. Other auxin response factors ARF3, ARF4 were also active in cambium, but their expression domains were broader. The authors showed that it was no coincidence that the cambium cells express both WOX4 and ARF5 regulatory proteins together with the auxin response sensor. To prove that they all are pieces of one puzzle, the scientists performed a rigorous study of the regulatory protein expression in the mutant plants. Mutant plants had a changed activity of the key regulatory proteins: the regulator was either not synthesized at all, or was &laquobroken» with a reduced or enhanced activity. Mutants for key regulators of cambium growth had significant differences in the thickness of the cambium layer and arf5 and wox4 mutant plants had opposite effects on cambium: it was wider than normal in arf5 and smaller in wox4. In both mutants the corresponding genes were damaged, thus, ARF5 and WOX4 proteins were not synthesized leading to the disruption of cambium proliferation functioning. Moreover, higher level of WOX4 protein was detected in arf5 mutant. Simply this means that when ARF5 protein is broken it doesn't affect WOX4 gene expression, so that the gene activity increases. Together these observations proposes that ARF5 fulfils its function partly by directly attenuating WOX4 activity. The next question arises if ARF5 affects WOX4 directly, or there were other mediators. The scientists from Novosibirsk, Russia predicted the presence of two binding sites for auxin response factor ARF5 in WOX4 regulatory region. One of the sites have been shown bound by ARF5 in vitro. The international group of scientists enlighten a long-observed role of auxin signalling in radial plant growth. Three auxin response factors — ARF3, ARF4 and ARF5 have been identified in regulating of cambium activity. The distribution of the response factors together with other cambium regulators was observed in plant tissues in detail in comprehensive gene-engineering experiments. The paradox is that although ARF5 is crucial for promoting plant growth, however it acts as a repressor for WOX4 and thus restricts the cambium formation. At the same time, WOX4 depends positively on auxin signalling overall. So the particular role of other auxin response factors (except ARF5) in control of cambium activity still remains puzzling and has to be discovered further. The study was supported by the German Research Foundation, Heisenberg professorship to Thomas Greb, Russian Science foundation.